If you spend a fair amount of time among privileged dot-com types, you’ll probably be familiar with Uber, a kind of luxury car service for the smartphone era. The idea is that you pull out your iPhone, punch a couple of buttons, and in a few minutes a swanky black car pulls up to drive you to your next destination. You get out, no tipping, and the cost of the fare is automatically charged to the credit card you have on file. Elegant! You do pay for that convenience. An Uber cab costs significantly more than you’d pay for a taxicab, and I’ve met a lot of people who suffer from Uber sticker shock. I’m one of them, truth be told: After getting charged $43 for my first Uber cab ride last month, I haven’t used it since. I probably will at some point, when the trip is shorter or when it’s raining or when I’m stuck in the middle of nowhere and there’s no easy way to get a cab. But if you start getting into the habit of using these cars on a regular basis, that habit can get expensive fast. 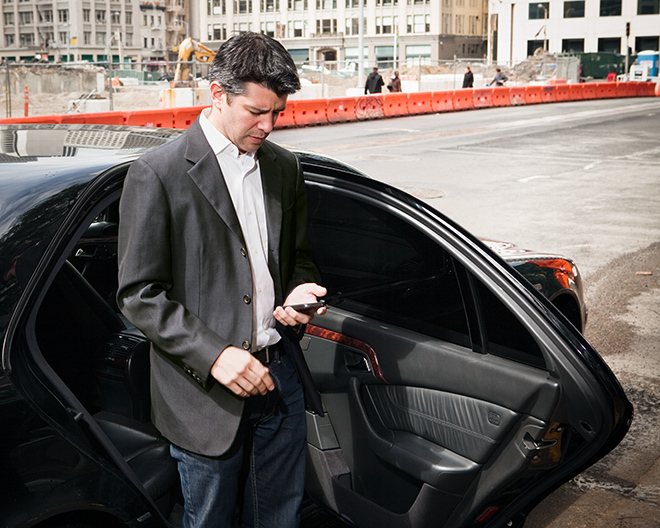 Uber doesn’t seem to have worked out how it wants to deal with the central question of cost. On the one hand, it’s positioning itself as “everyone’s private driver”: It basically stands in relation to the chauffeur-driven car as NetJets does to the private jet. And compared with the cost of hiring a full-time car and driver, Uber is certainly dirt cheap. On the other hand, Uber doesn’t like being told that it’s out of reach for people without a lot of disposable income. When Marlooz, a soi-disant “poor freelancer,” said that Uber was “too expensive” for her, the company responded with a 1,750-word data-filled blog post explaining how, even though Uber costs twice as much as a cab, it’s still a good deal. Especially if you’re calling for a cab in San Francisco on a weekend evening, when most of the time the cab you called won’t even turn up. But the fact is that Uber is too expensive for most people. Hell, taxis are too expensive for most people. Uber is a luxury service, and they charge accordingly. Cab rates aren’t entirely apples-to-apples, but they generally have three components: a fixed base fare, and then a rate for time and a rate for mileage. The meter works out whichever is the higher, and charges you that. 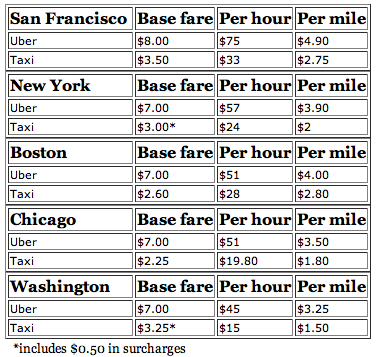 And if you compare Uber’s rates to the taxi rates in San Francisco, New York, Boston, Chicago, and Washington, you can see that Uber is a lot more. The other thing which becomes clear when you look at these prices is that Uber raises its prices pretty much in lockstep with local taxi rates. The cheapest Uber cabs — the ones in Washington — are still significantly more expensive than the most expensive yellow cabs — the ones in San Francisco. But on an absolute basis, it’s easy to see why people in Washington feel happier grabbing an Uber to get home than people in San Francisco do. If you get stuck in traffic and it takes 30 minutes to get home, that’s $29.50 in Washington; in San Francisco, it would be $45.50. On top of that, Uber has dynamic GPS-based pricing which automatically charges you on a per-mile basis whenever the car is going faster than 11mph, even if it’s only for a brief period of time. And then of course there’s the fancy surge pricing that we saw on New Year’s Eve, when people started getting charged exorbitant rates — Brenden Mulligan, for example, got charged $75 for a ride which took just 136 seconds, and Dan Whaley got charged $135 to go 12 blocks. Uber loves to explain its surge pricing with fancy supply-and-demand curves, but you could call it a “rip off drunk people” strategy too. Mulligan has ideas about how Uber’s software could be improved: at the very least, it should display the current minimum fare prominently, rather than just the current multiplier.